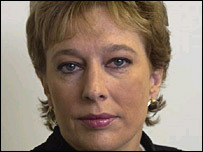 Ridley: "The Koran makes it crystal clear that women are equal"
She now describes radical cleric Abu Hamza al-Masri as "quite sweet really" and says the Taleban have suffered an unfair press. "Wow - you're gorgeous," she says. "He had those amazing green eyes that are peculiar to that region of Afghanistan and a beard with a life of its own. "But fear quickly took over. I did see him again on my way to Pakistan after my release and he waved at me from his car." Ridley was interrogated for 10 days without being allowed a phone call, and missed her daughter Daisy's ninth birthday. Of the Taleban, Ridley says: "I couldn't support what they did or believed in, but they were demonised beyond recognition, because you can't drop bombs on nice people." But she says: "I was horrible to my captors. I spat at them and was rude and refused to eat. It wasn't until I was freed that I became interested in Islam." Indeed, the Taleban deputy foreign minister was called in when Ridley refused to take her underwear down from the prison washing line, which was in view of soldier's quarters. "He said, 'Look, if they see those things they will have impure thoughts'." "Afghanistan was about to be bombed by the richest country in the world and all they were concerned about was my big, flappy, black knickers. "I realised the US doesn't have to bomb the Taleban - just fly in a regiment of women waving their underwear and they will all run off." "I was absolutely blown away by what I was reading - not one dot or squiggle had been changed in 1,400 years. "I have joined what I consider to be the biggest and best family in the world. When we stick together we are absolutely invincible." "Initially the reaction of my family and friends was one of horror, but now they can all see how much happier, healthier and fulfilled I am. "And my mother is delighted I've stopped drinking." What does Ridley feel about the place of women in Islam? "There are oppressed women in Muslim countries, but I can take you up the side streets of Tyneside and show you oppressed women there. "Oppression is cultural, it is not Islamic. The Koran makes it crystal clear that women are equal." "How liberating is it to be judged for your mind and not the size of your bust or length of your legs." "I no longer sit and wait by the phone for a man to ring and I haven't been stood up for months. "I have no man stress. For the first time since my teens I don't have that pressure to have a boyfriend or husband." 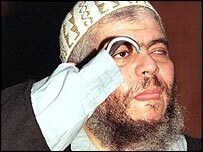 But there has been a phone call from at least one male admirer - north London preacher Abu Hamza al-Masri. 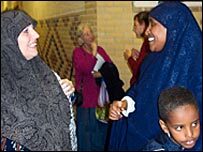 "He said, 'Sister Yvonne, welcome to Islam, congratulations'. "I thought, I can't believe it, this is the fire and brimstone cleric from Finsbury Park mosque and he is quite sweet really. "I was just about to hang up when he said, 'But there is just one thing I want you to remember. Tomorrow, if you have an accident and die, you will go straight to hellfire'. "I was so scared that I carried a copy of the vows in my purse until my final conversion last June." "Praying five times a day. And I am still struggling to give up cigarettes."